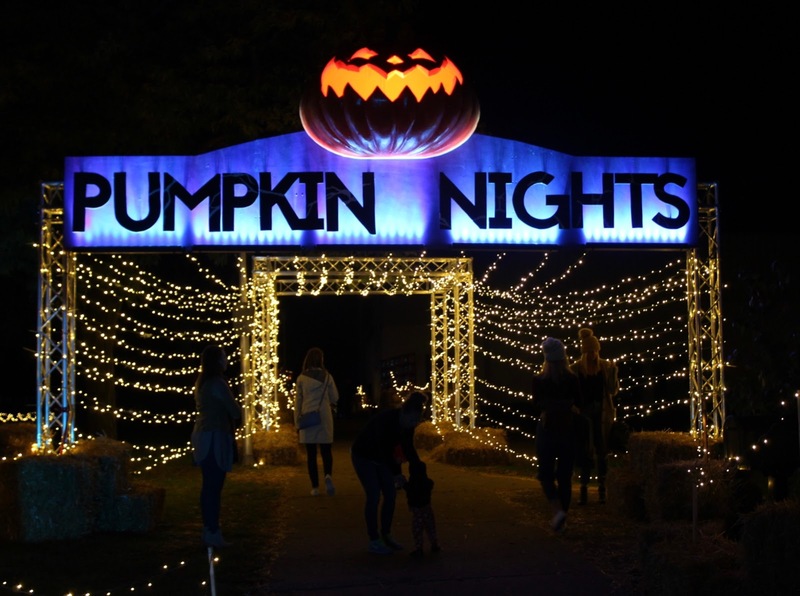 Pumpkin Nights is an outdoor festival that engages you on a half-mile trail through over 3,000 hand-carved synthetic and 1,000 fresh pumpkins put together in a variety of ways and displays to create an incredible one of a kind experience. We have seriously never seen anything like it. Last year was the first year it opened in the Twin Cities, and we were thrilled to have the opportunity to attend this year for their return. The pumpkin displays are created to portray a variety of different settings or worlds that you enter as you walk the course. You will find everything from the "Great Pumpkin Reef" to the space themed "Pumpkin Galaxy" to our personal favorite (pictured immediately below), "Dia de los Muertos". In addition to all of the lighted pumpkin wonder, there are also a variety of other activities for families including pumpkin carving demonstrations, various performers, a Halloween-themed bike course (we will catch that one next year), movie screenings and a variety of food and drink options so you can indulge while you walk. Costumes are also encouraged- so it is a great way for your kids (or you for that matter) to enjoy them more than once! We didn't have our act together well enough yet when we went to deck Asher out in his costume for this year (we are last minute DIY people), but we did deck him out in some festive jammies for the event. I have never seen such wonder and amazement on our little guy's face. He is just starting to figure out walking and insisted on walking nearly the entire course so he could point out and really investigate everything himself. By the time we left it was nearly 2 hours past his bedtime, and he was still rearin' and ready to go. The only time he actually got upset was when it was time to leave. Pumpkin Nights - Twin Cities runs through this Sunday, October 29th. If you haven't yet had the chance to experience this local adventure with your family and friends, we would highly recommend it (as you can see it's been "toddler approved"). Ticket information and other details can be found through the Pumpkin Nights website. Because we loved it so much (and we think your family would love it too), I am also hosting a giveaway for a Family 4-Pack of tickets (a $64 value) to attend the event on one of the remaining days this coming weekend (Oct. 27-29th). All you need to do to enter is follow the instructions on the Rafflecopter below! Giveaway will run through Thursday, October 26th at 11:59pm, and the winner will be notified by 8:00am the following morning with a code to enter on the website to obtain your free tickets (so please be sure to use an email address the you check regularly). I saw your instagram photos of this and it looked fantastic! What a fun fall outing to add to the seasonal list! these photos are amazing! what a cool place to be at night! I would bring my husband and two kids...looks so cool!! That looks really fun and toddler friendly - great pictures Krista! I would bring my husband & son! Thisnlooks so awesome! We were talking about going but don’t think we can afford it! It would be awesome to win! We live right by the fairgrounds and have never been! Sounds fun! This looks beautiful! I would actually use it for date night! I would love to bring my LO to check this out! It looks like such a blast!